I met with my good buddy Reggie for lunch recently to talk guitars and gear, and also for him to pass me a batch of his superb homemade cheng tng -- a sweet Chinese dessert known for its cooling or 'yin' properties. We all need to balance our yang with some yin once in awhile. And if we can get our yin while satisfying our sweet tooth, so much the better. Tupperware containers of cheng tng firmly in hand, Reggie told me he wanted to show me a guitar he had left in a music store that was awaiting a refinish. I thought it was going to be just another 'vanity refinish', much like the refinish job I had done on my Gibson Les Paul BFG a few months ago. Purely cosmetic and didn't really need to be done, but you know how it is -- a newly refinished guitar is the next best thing to a new guitar! We entered the shop, made some small talk with the owner and looked around a little bit. Reggie disappeared into a corner of the shop and reappeared holding a guitar. It was going to rain outside and it was getting a little dark in the shop, but judging from the silhouette (no pun intended!) 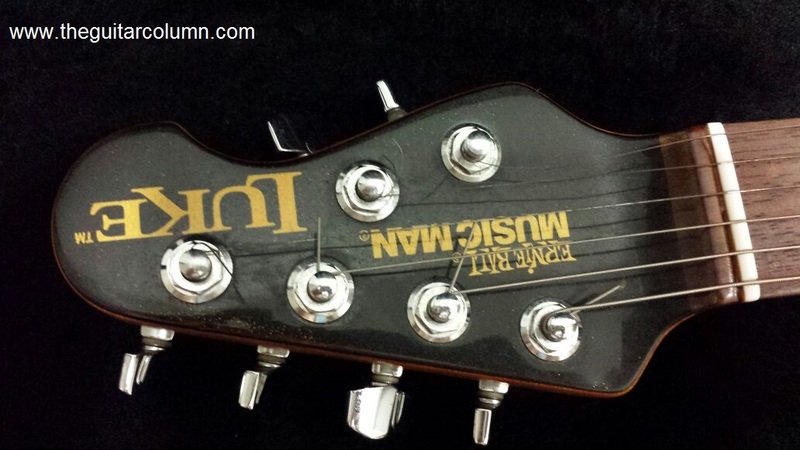 of the headstock, I could tell it was a Music Man guitar of some sort. And when he brought it into the light, I could hardly believe my eyes. 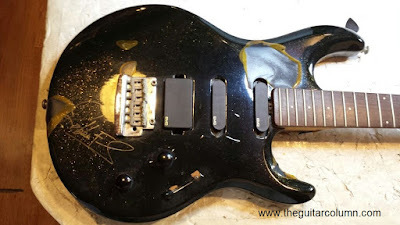 There it was, an Ernie Ball/Music Man Luke model sans strings and looking a little worse for wear. Which is probably a huge understatement. 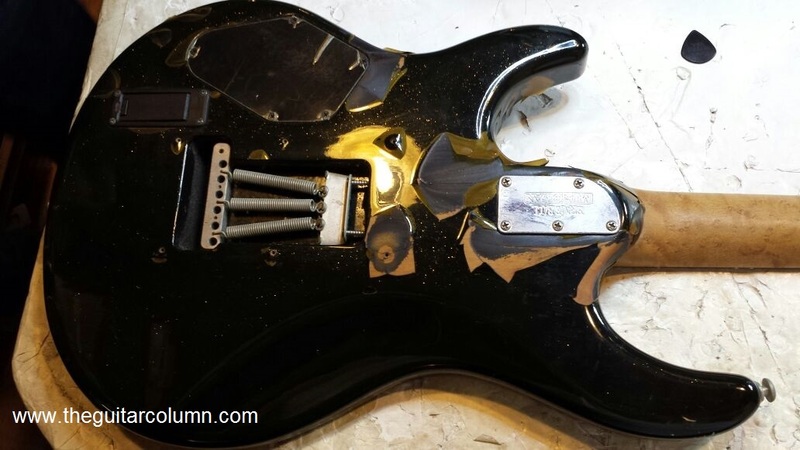 The black sparkle polyester finish seemed to have cracked and was lifting off in chunks, leaving either bare wood or the black undercoat. 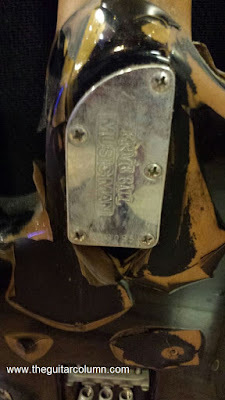 Indeed a small piece cracked off as I was examining the guitar and when I picked the piece up off the floor, I found it had the texture and brittleness of a potato chip, yellowed, hard and crumbly. It was something that, in my 40 years of being around guitars, I had never seen before. And as we all know a polyester finish is as hard and durable a finish as you can get. 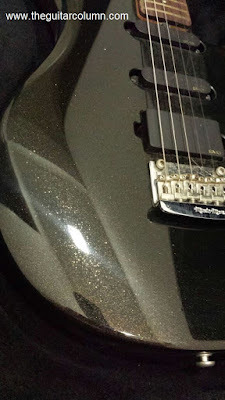 My luthier friend, Luca Quacquarella, was just complaining to me a few months ago about how difficult it was to scrape off a polyester finish, saying that even an overnight soak in paint remover sometimes failed to do the job! 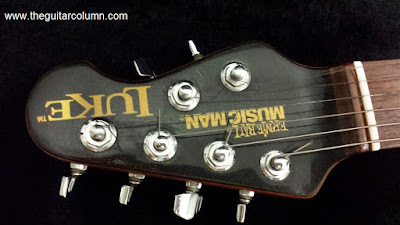 But frankly, Ernie Ball/Music Man finish problems are something not entirely new to me. Another good buddy of mine returned from the States in the early 90's with a fire-engine red 5-string Music Man bass. It played great and sounded even better. Ernie Ball chose not to mess with the original Leo Fender-era Music Man bass's design and electronics, and the pickups on this bass were classic Sting Ray with all their growl and clarity. Paired with a highly figured bird's eye maple neck, the glossy red finish was also really something to behold. But after a couple of months of owning the bass, things started to go south rather quickly. That wonderful red polyester finish started to dull and become tacky and sticky to the touch. 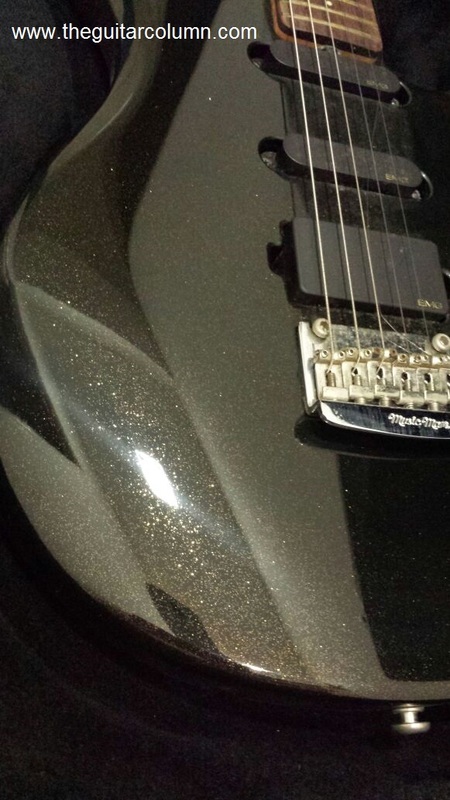 It got so bad that fibers from the inside of the hardcase were actually sticking to finish like tiny hairs. 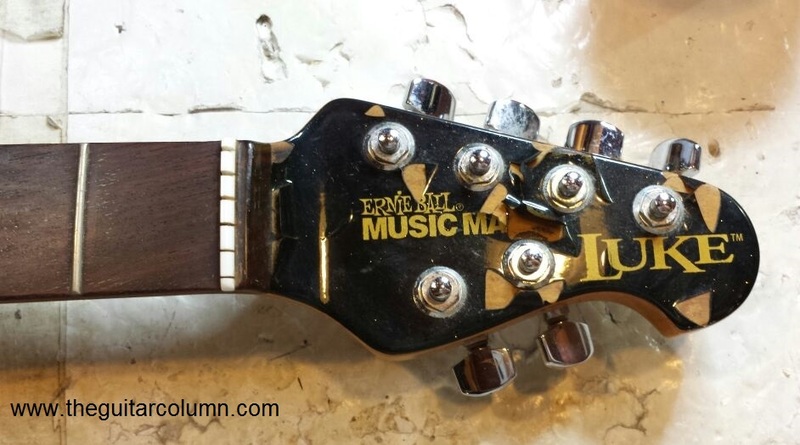 Fortunately, there was no Ernie Ball/Music Man dealer in Singapore at the time, or else they would have been faced with quite a sticky situation -- literally -- as this was not an isolated case. Put it down to Singapore's 90% humidity and tropical heat I suppose. 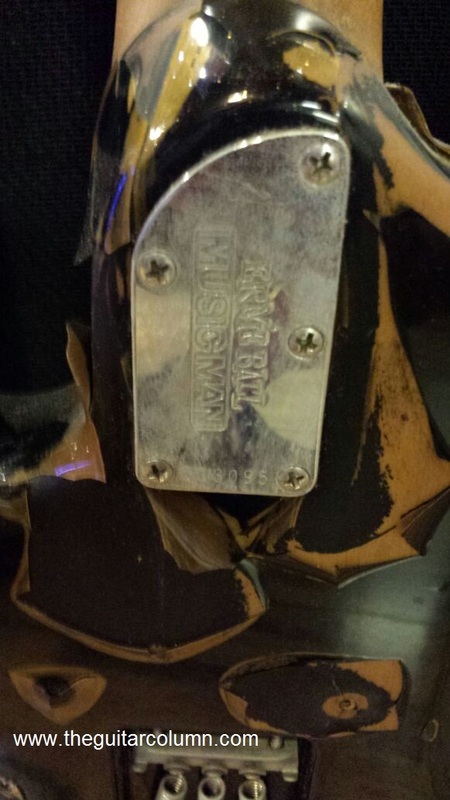 But strange that other major instrument brands never had the same problem. Oddly enough, Reggie owns another Music Man Luke also from about 2005 and in exactly the same color, and it is in pristine condition! The only thing indicating its age is that the Luke logo has yellowed from its original silver.